A natural process of aging needn’t hamper patients’ QOL. It is my pleasure to serve as guest editor for Ophthalmology Management’s 2017 AAO preview edition. We’ve dedicated this issue to presbyopia. More and more, we are reading about innovative approaches for the correction of presbyopia. And for good reason. International census data from the last decade indicated that there were more than 1 billion presbyopes worldwide. Half of these patients did not have access to reading glasses, and 80% of those patients were unable to perform work adequately.1 With an aging world population, the number of presbyopes is expected to increase to more than 2 billion by 2020, or 4 billion presbyopic eyes. 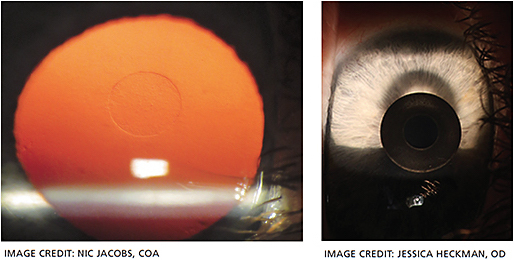 As part of our presbyopia issue, we highlight both the Kamra (top) and Raindrop (bottom) corneal inlays. Because of these staggering demographics and its potential global impact on our economy and lifestyle, the presbyopia burden is receiving its due attention. This common refractive disorder presents us with a wonderful opportunity to help our patients. In this issue, we will explore how to do just that, covering numerous aspects of the surgical management of presbyopia, such as lens-based, scleral-based and corneal-based approaches. For example, we lead off with an excellent article from Daniel Goldberg, MD, which provides a big-picture view of presbyopia: its mechanism, prevalence and societal burden that it imposes on all. We cover both FDA-approved corneal inlay options to treat presbyopia. Amir Moarefi, MD, and William F. Wiley, MD discuss the Kamra inlay (AcuFocus), while Jeffrey Whitman, MD, Shilpa Rose, MD and Mark Whitten, MD, highlight the Raindrop near vision inlay (ReVision Optics). Another package of articles tackles dysfunctional lens syndrome (DLS). Ken Beckman, MD, presents the case for treating DLS with VisAbility scleral micro-inserts, while Mitch Jackson, MD, and AnnMarie Hipsley, DPT, PhD, make the case for treating DLS with LaserACE. Both of these treatments are still under investigation. In addition, we cover presbyopia-correcting IOLs and diagnostics, preview the AAO meeting in New Orleans and more. Holden BA, Fricke TR, Ho SM, et al. Global vision impairment due to uncorrected presbyopia. Arch Ophthalmol. 2008;126:1731-1739.